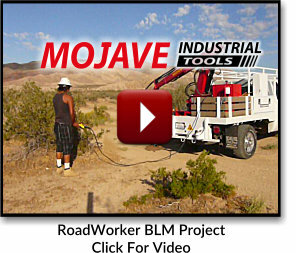 There are so many uses for the RoadWorker and the UtilityWorker, it is impossible to list them all here. Both Units provide a hydraulic boom for your toughest jobs. Companies like Stanley and Atlas Copco manufacture tools that work with both Units. The UtilityWorker is a RoadWorker on Steroids! 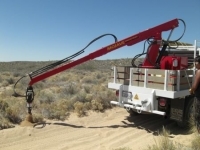 Demolition Equipment, Breakers, Circle Saws, Cut Off Saws, Earth Augers, Rock Augers, Post Drivers, Pruners, Tampers, Spike Pullers, Grinders, Chain Saws, Hammer Drills, Chipping Hammers, Crimping Tools, Ground Rod Drivers, Post Pullers, Pumps, Tree Trimming, Spike Drivers, Tie Tampers, Rail Drills, Impact Wrenches, Drills. 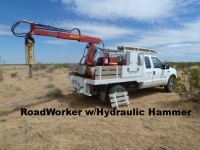 Federal Government, State, County, City and School Districts as well as Railroads and Contractors all benefit from the RoadWorker and the UtilityWorker. Here are a few applications. I’m sure you can think of others. 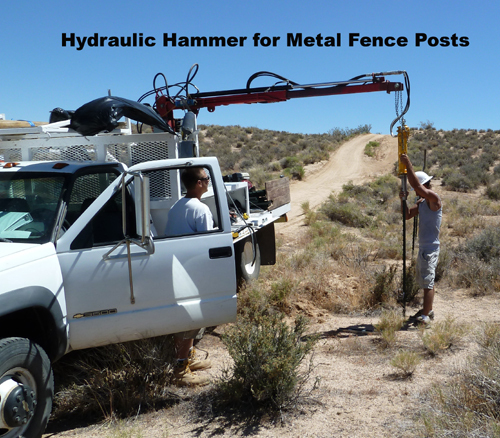 Federal: We’re installing thousands of signs, peeler posts and fence posts on Federal land. State: State Highway Crews can quickly repair remote guardrails. The RoadWorker and UtilityWorker have small footprints reducing the need for lane closures. 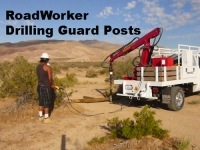 You can quickly install T-posts for signs as well or drill a hole for posts and signs. Add a winch and remove large animal carcasses from the highway. County: Use the RoadWorker to lower sewage pumps to remove blockages. Install signs of many kinds. 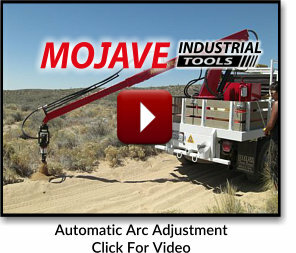 Use it to plant trees and shrubs. City: Add a magnet to remove manhole covers. Drill fence post, street light and traffic signal holes. Schools: Drive onto school campuses with a truck instead of a truck and trailer. It’s much safer. Use the RoadWorker when installing basketball and tether ball poles, working in terraced planters and installing fencing. There are many more applications. Please contact us and we’ll add your ideas to our ever growing list of applications.